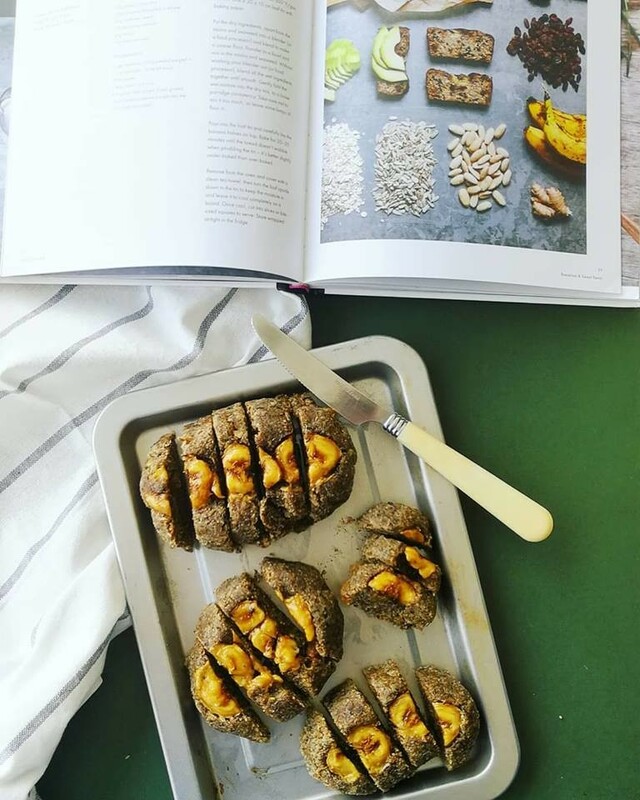 Savoury Banana Bread - my raw vegan version adapted from Bento Power by @shisodelicious. I wanted to try to convert some of her recipes into raw vegan versions. So here you go, I took my raw vegan bread recipe and combined it with hers to make this. Process sunflower seeds and seaweed into mill attachment of food process and process into flour-like consistency. Pour into mixing bowl. Add remaining dry ingredients into a mixing bowl and mix well. Pour in wet ingredients and fold till combined. Using hands, shape the dough into a bread loaf. I made them into mini loaves. Press in banana slices on top of bread to decorate. Place on non-stick sheet and dehydrate for 3 hours at 45 degrees Celsius in food dehydrator - I use @excaliburdehydrator. Slice the bread and place on mesh sheet and dehydrate till desired consistency. Verdict? Mr Jazz Guitarist and I both loved it. I would have put in more bananas but generally @azsamad doesn't like bananas (altho there are exceptions). I really like the idea of including miso and seaweed in my bread. It's like a little surprise as I can taste bits of seaweed while savouring the bread. Thank you Sara for the inspiration, I think I will be adding miso into my bread from now on! I brought them along for the whole family from @viaworldschooling to try and Keesha said she loved it as well. I think the kids likes them too as they ate up all their slices.